With so many good blogs and informative websites out there it does not mean that you stop using PDF files. Like my bank sends me at least two PDFs daily – one containing information about stocks I’ve bought or sold on that day and another containing information about my daily transactions. Further I come across several e-books daily which are available in PDF format. My college professors too give us PDFs. Even the support manual of most online products are available in PDF format. Even you might be in the same boat as me and even if you are not, it’s still a good idea to know about viewing PDFs online! While downloading a PDF reader like Adobe Acrobat Reader or Foxit Reader is a better idea than viewing PDF files online, sometimes viewing a PDF online might be the only option. Here are ten best online PDF readers which enable you to view PDFs online. Some of them even allow you to edit PDFs! Open Google Drive on your favorite browser. 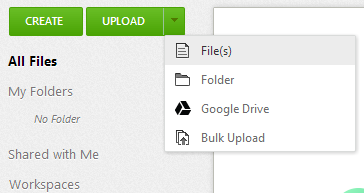 Click on the upload icon -> Files to upload your PDF. The file will be uploaded in no time. Your file will now be visible in your drive. Click on the file name. The PDF will load on the same page. Click on the ‘Open’ button to load it on a different page. There’s a lot more you can do with Google Drive like you can export PDF to document, edit PDF and more. Just play with options. Zoho Docs is similar to Google Drive. You have to create an account after which you can start uploading your files. Follow the previous link to create a Zoho account and then click on the upload button. Click on ‘Start Upload’ to continue the upload. Wait for a few seconds for the file to be uploaded. Once uploaded click on the file name to read the PDF. SamurajData is yet another online PDF viewer. Simply head on to https://view.samurajdata.se/ -> Paste the URL where your PDF file is hosted or alternatively upload your PDF file and hit the ‘View’ button. Your file will shortly load and then you can read it. They’ve already linked to some example files in case you just want to test the tool. It doesn’t allow you to edit files though. You can use a very simple tool like the PDFOnlineReader to read PDFs online. Visit this link -> Click on ‘Upload PDF’ -> Select the file and then wait for the file to be uploaded. 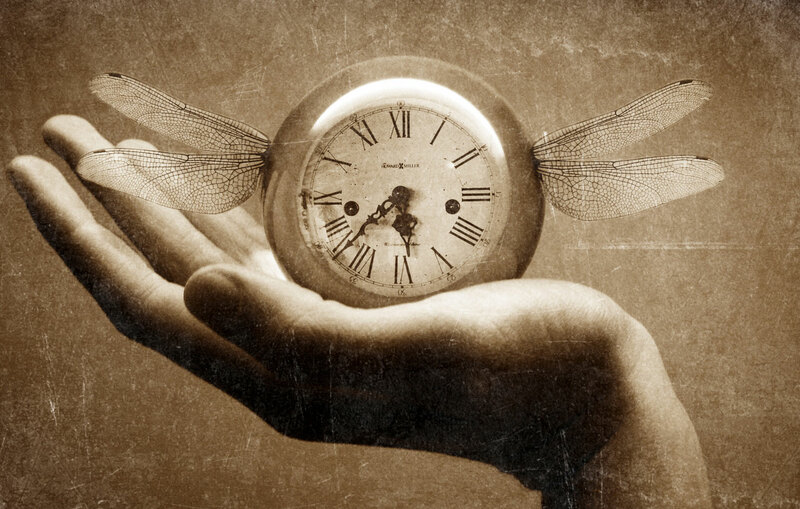 The time taken depends on the size of your file. Once your file is uploaded it loads automatically. It’s another online PDF reader which I came across while browsing my friend’s StumbleUpon account. 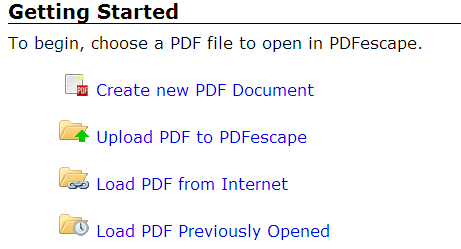 Simple head over to pdfescape.com and click on ‘Edit Your PDF Now’ button. Chill if you don’t want to edit your file. You can read it anyway. 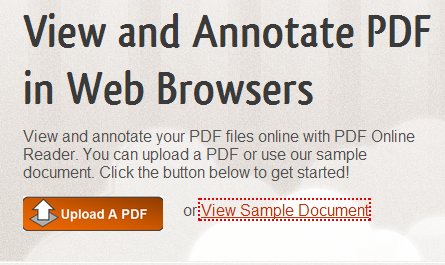 Upload your PDF file by clicking on the second link. If your PDF file is hosted somewhere on the internet click on the third link -> paste the file URL. If you’ve used PDFescape previously, click on the fourth link. Once done the file opens automatically in your browser. View Docs Online allows you to do more than just view PDFs. 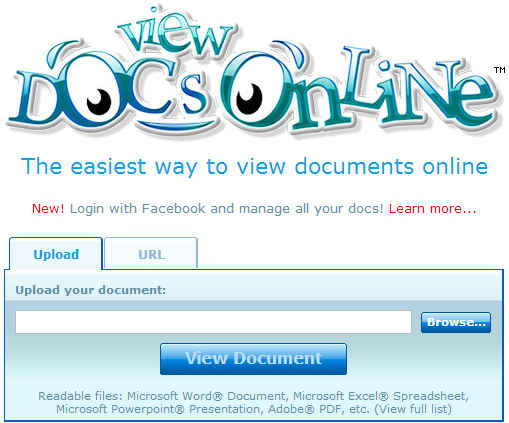 With View Docs Online not only can you PDFs but also view Word documents, spreadsheets, presentations and more. Using it is very simple. Simply upload the file you wish to read or paste the link if the file is already present somewhere else and then hit the ‘View Document’ button. 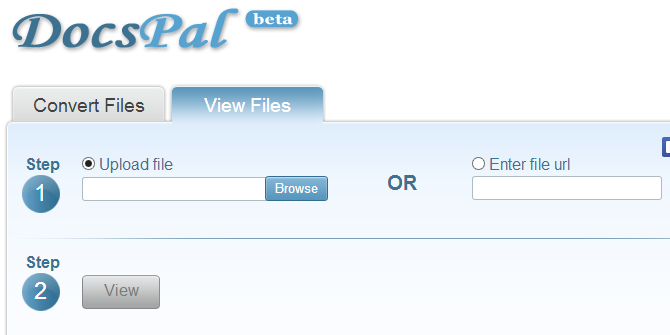 DocsPal is another free online PDF reader. Well it’s more than just a PDF reader. Along with PDFs it can also read word, powerpoint, open office documents, djvu, ps, jpeg 2000, png, psd, tiff and more. With DocsPal you can also open various image formats including PSD, videos, music, ebooks and archives. Not only that. You can convert any format to any other format. Of course it has some limitations like you cannot convert a video to word document 😉 To use DocsPal is easy. Simple head over to their site -> Upload a file or paste the file URL if you’ve already uploaded it somewhere else and then click on ‘View’ button. Well I’m sure you must have found a PDF reader of your choice, but if you haven’t here’s another one. I actually don’t like using it since it requires me to create an account, but still you can try it if you don’t mind spending extra 30 seconds on creating and activating an account there. It’s simple and won’t take more than 30 seconds. Also GroupDocs supports many formats which include DOC, DOCX, TXT, RTF, ODT, PPT, PPTX, XLS, XLSX, PDF, JPG, BMP, GIF and TIFF. It guarantees speed and quality. You can try it here. I’m not a great fan of PDF24, but since a fan wanted it to be here, I’ve mentioned it. It asks you to install an additional plugin on your browser and that’s the primary reason why I hate it because none of the above tools require any additional plugins. You can try PDF24 here. I’m too bored to look for the tenth online PDF viewer so if you have any, please mention it in the comments and I’d be happy to include it here. Do not suggest a paid PDF reader or promote your tool. If it’s free I won’t mind mentioning your tool here! Reading a PDF Online vs a PDF Software – Which is Better?